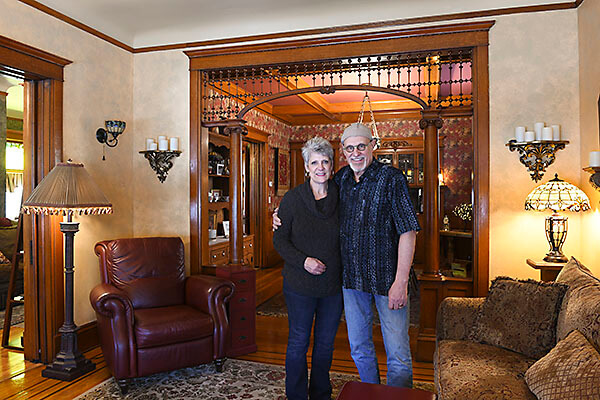 Our 1891 home was split into a duplex in the early 1900s when the owner’s married son needed a place to live, however, our dream was always to return the home to its original style. Over 33 years we have worked to return the home to a single family dwelling with period conscious design elements, while maintaining a comfortable living space. We utilize three floors of living space plus a bonus creative room in the attic with painstakingly unearthed original wallpaper from 1900. The house has two decks plus a larger backyard deck/pergola entertaining area with beautiful gardens within view. We have upgraded our carriage house from a two-horse stall and carriage stall to a functional modern garage.